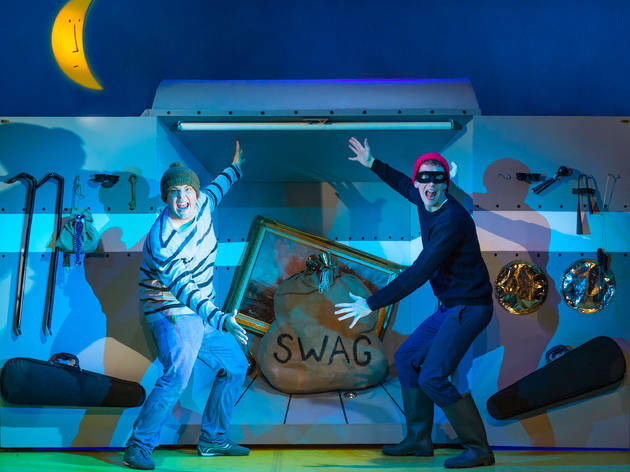 This stage adaptation of the well-known Julia Donaldson book is thoroughly entertaining for children and adults alike with great characters, a fast paced plot and enjoyable songs, but falls slightly short of any wow factor. It follows the story of a ladybird who saves the day on a farm by scuppering the plans of two thieves out to steal the fine prize cow. It's a clever story and easy to follow, though kids will definitely benefit by being familiar with it beforehand. There are some great folk-themed musical arrangements performed with live instruments which is a nice touch, though some songs are quite long and lack sing-a-long-ability - no child will be heading home with a tune stuck in their head. 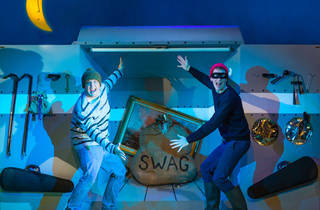 The character that makes this show worth visiting alone, winning over both children and adults is robber Lanky Len who is full of amusing voices and daft actions, the main comedy vehicle in the play. Scenes of Len and his side kick Hefty Hugh are a lite version of the amusing criminal double act in 'Home Alone'. The show has a panto feeling to it with moments of 'he's behind you!' and 'boooo, hissss! '; and this is welcome - the one bit of audience participation really livened up the crowd, and it's a shame there wasn't more. Still, for a first experience of live theatre i(it's for ages three-plus), this is well worth a visit.